When my 31 Crockpot Freezer Meals for Back-to-School when viral a lot of people asked me how to modify my recipes for two people. 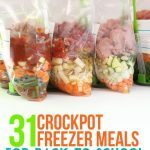 Typically, my recipes have 4-6 servings, so my answer was to split each freezer meal in half and cook it in a smaller crockpot. 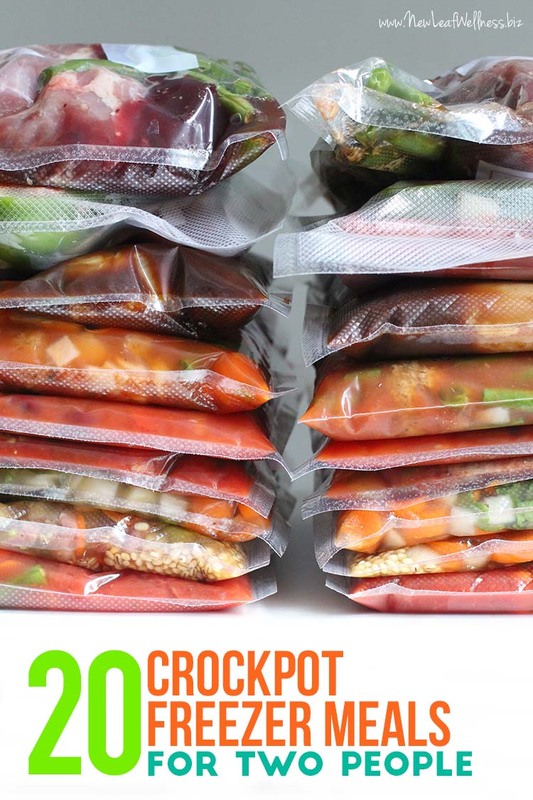 I decided to give this method a try myself and picked 10 of my favorite crockpot freezer meals to split into 20 freezer meals with 2-3 servings each. I already tested out a couple of the meals in two new mini crockpots that I bought and they were delicious. 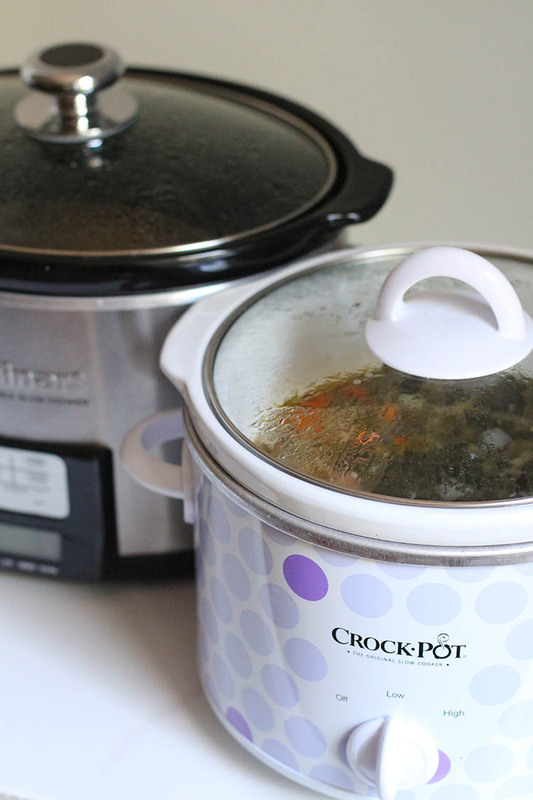 Both of the crockpots were highly rated on Amazon and they work perfectly with these smaller meals. Cuisinart 3.5 Quart Programmable Slow Cooker – has a timer and a longer cooking time so it’s perfect for people who need to be out of the house 10-12 hours a day. Crock-Pot 2.5 Quart Slow Cooker (polka dot pattern) – cooked my meals perfectly in 8 hours. I’m going to give this one to my grandparents with the remaining freezer meals. It took me a little less than three hours to prep all 20 meals (including clean-up) and I spent $122 on ingredients. That works out to only 9 minutes and $6 per meal. I’m pretty sure there’s no cheaper and easier way to prepare healthy dinners. 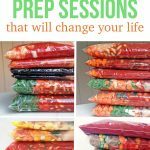 One thing I learned from this freezer meal prep session was to stick with regular name-brand freezer bags. 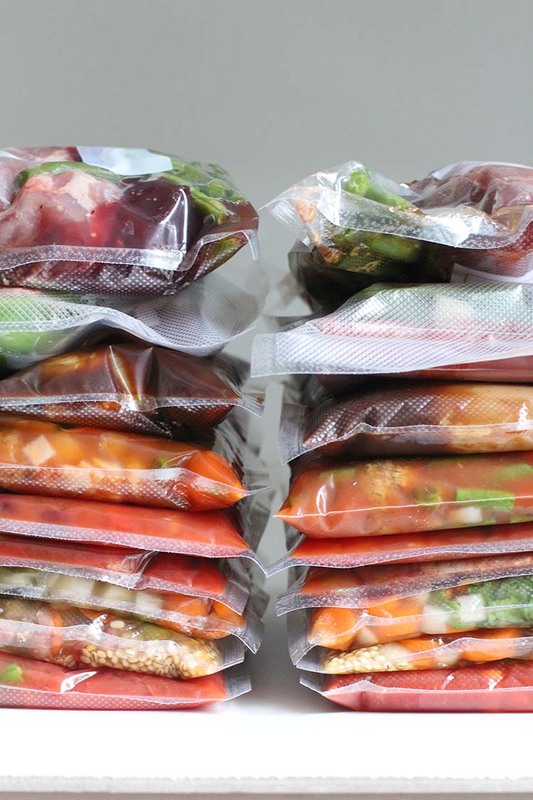 I thought that these smaller meals would work in the Ziplock vacuum bags, but the hand pump made a huge mess and several of the bags leaked. What a disaster! Have yo seen the new slow cookers that have a thermometer built in? you set the desired temperature and the appliance goes to warm when it reaches the right temperature. I wonder how cooking in a 6 Quart crock would affect the cooking time for the smaller meals? If at all. You’ll have to be careful not to overcook them. I would definitely decrease the cooking time. I’m seriously considering the small Cusinart one with the timer recommended above. I have put a smaller Pyrex type bowl into the crock and have been happy with the results. If cooking in the small 2.5 slow cooker, are the cooking times the same as if making it as one bigger meal? i am giving these to my parents and they are completely new to using a slow cooker so I want to make sure they have good directions 🙂 I am planning on making Honey Dijon Chicken, Grandma’s Beef Stew, and Italian Pot Roast which I will split into the two smaller meals. 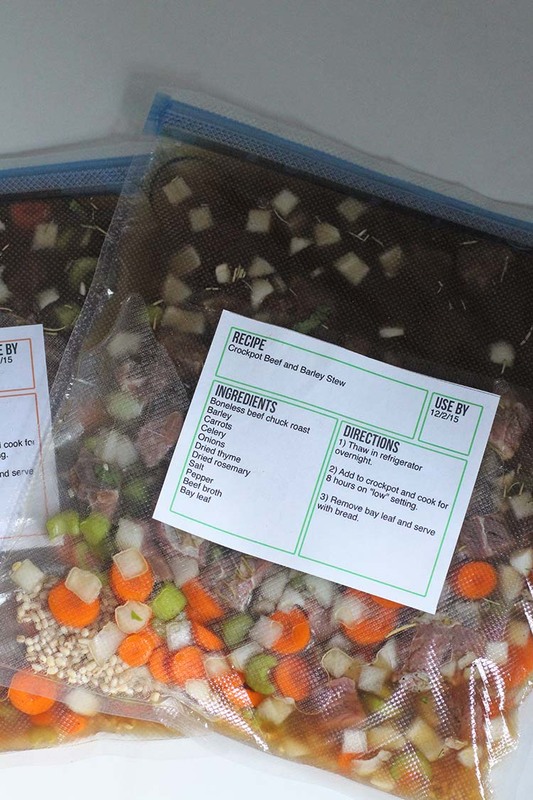 They are the same as what I included in the printable pdf and freezer labels. I specifically wrote them for small slow cookers (2.5-3.5 quarts). The original recipes are written for the full sized meals. I was wondering do you use Ziploc Freezer bags or something else? I recommend name-brand freezer bags, like Ziplock or Hefty. I use both of them – whatever is on sale. I’m dying to try a FoodSaver though!! I’ve had great results with Meijer brand freezer bags as well. Love the 2.5 quart crockpot when cooking just for my empty nest. Think I paid $12 for it on sale around the holidays. 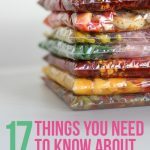 I have had wonderful results with my food saver, but be mindful. Freeze first! Then vacuum seal. You do not want liquid sucked into the machine. I have one with the pulse vac button & rarely do I not freeze first. Great tip, Karen. My husband vacuumed blueberries. We’ll freeze first next time! The ones in this post are the ziplock vacuum bags, but I would not recommend them. I like name-brand gallon-sized freezer bags, like Hefty and Ziplock. I never have issues with them.